The American Society of Clinical Oncology (ASCO) Annual Meeting is right around the corner. From Friday, June 3 to Tuesday, June 7, more than 30,000 oncology professionals from around the world will meet to discuss the latest research in state-of-the-art treatments, new therapies, and patient care. 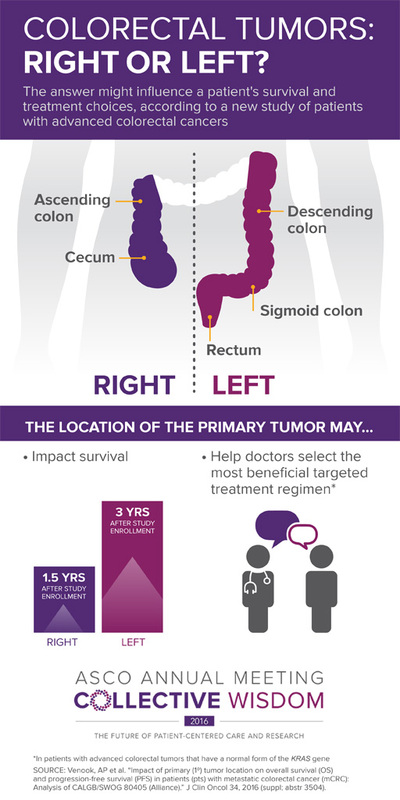 Researchers have discovered that a colorectal tumor on the left side of the body may be different from one on the right side. For patients with metastatic colorectal cancer that started on the left side of the body who received the drugs bevacizumab (Avastin) or cetuximab (Erbitux) the median survival was about 33 months, compared with about 19 months for those with tumors on the right side. The median is the midpoint, which means that half of patients lived longer and half lived for a shorter time. Researchers also found a slight difference in how well cetuximab or bevacizumab worked based on the side of the body where the cancer started. For example, patients with a tumor on the right side who received bevacizumab lived about 7 months longer than those who received cetuximab. And patients with a tumor on the left side who received cetuximab lived about 6 months longer than those who received bevacizumab. What does this mean? In the future, doctors may use this information to determine treatment options for each patient. Researchers found that beginning palliative care shortly after a cancer diagnosis results in better quality of life and fewer symptoms of depression for family caregivers. As part of this study family caregivers were asked to complete a questionnaire at the start and again at 12 and 24 weeks. The questionnaire provided numerical measures of physical and mental well-being that can be compared over time. The caregivers who participated were all caring for patients newly diagnosed with incurable lung or gastrointestinal cancers receiving treatment as part of a clinical trial. As part of the clinical trial, patients received either early palliative care plus standard treatment for the cancer or only standard treatment for the cancer. At 12 and 24 weeks, caregivers of patients receiving early palliative care had fewer symptoms of depression than caregivers of patients receiving only standard cancer treatment. In addition, their levels of vitality and social functioning improved at 12 weeks. What does this mean? In addition to helping patients, palliative care also benefits caregivers. In this study, patients with multiple myeloma who received an autologous stem cell transplant (ASCT) were 24% less likely to have the disease worsen in the future than patients who received only chemotherapy. The benefit was much greater for patients with advanced disease, who were 48% less likely to have the disease worsen. As part of this study, patients initially received a combination of the drugs bortezomib (Velcade), cyclophosphamide (Neosar), and dexamethasone (multiple brand names). Then, patients received either an ASCT or chemotherapy with bortezomib, melphalan (Alkeran), and prednisone (multiple brand names), a combination called VMP. All patients continued to have treatment after ASCT or VMP until the disease worsened or caused too severe side effects. This treatment was either a combination of bortezomib, lenalidomide (Revlimid), and dexamethasone or lenalidomide only. This study is ongoing, and the results discussed here deal with the differences between ASCT or VMP. What does this mean? Since its approval in 2008, bortezomib has been a part of standard treatment for patients with newly diagnosed multiple myeloma, whether or not they are able to tolerate ASCT. In general, patients older than 65 are usually not able to have ASCT. For those younger than 65, the continued need for ASCT has been debated now that drugs like bortezomib are available. A look at data from several early studies showed that patients whose treatment was selected based on the molecular characteristics of the tumor were more likely to have the tumor shrink and less likely to have the disease worsen. In this analysis, researchers looked at 58 studies that used biomarkers or tumor markers to select treatment and 293 that did not. All but one study was evaluating a targeted treatment. Researchers found that about 31% of patients who received treatment based on biomarkers experienced tumor shrinkage, compared with about 5% of patients who did not receive treatment based on biomarkers. What does this mean? Phase I studies usually focus on the safety of specific treatments. This analysis suggests that these early studies may also help find out how well a treatment works and which patients are most likely to benefit. An early study finds that 40% of patients with advanced melanoma are alive 3 years after starting treatment with pembrolizumab (Keytruda), a type of immunotherapy called a PD-1 inhibitor. In this early study, about 75% of patients had already received additional treatments, including another type of immunotherapy called ipilimumab (Yervoy). What does this mean? According to the researchers, it is difficult to make any definitive conclusions based on this early study, but it suggests that patients can benefit from pembrolizumab regardless of whether they received previous treatments. 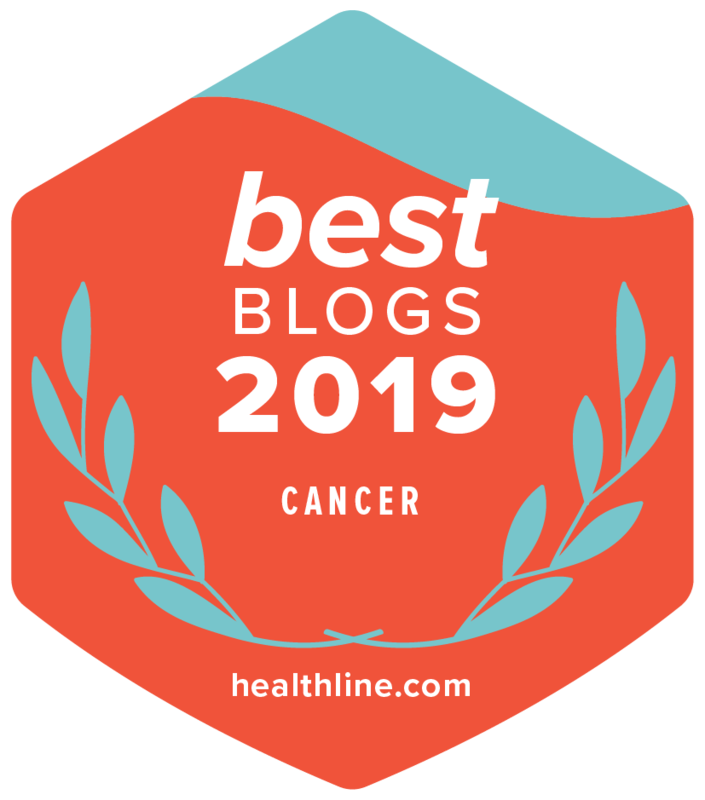 You can keep up with the news coming from the ASCO Annual Meeting by signing up for the Inside Cancer.Net e-newsletter. A special edition will be delivered right to your inbox every day of the meeting. Or visit the Cancer.Net Blog every day for more reports from Chicago. You can also follow Cancer.Net on Facebook and Twitter.